I received an Advanced Review copy from the author in exchange for an honest review. I invite you to read my review, watch the book trailer and win your own SIGNED hardcopy of the book (US/Canada). The first thing that struck me about A SUDDEN LIGHT is the rich and flowing prose that immediately sweeps the reader into the story. It begins on a very philosophical note that reminds me of a common theme in Greek mythology: a curse. When something of beauty is destroyed, the ancestors of the destroyer are cursed and pass on this curse until someone, somewhere along the family line is able to make amends. The universe must be paid back in order for the curse to be broken. Trevor is a 14 year old boy who had a happy and normal life with his parents growing up in Connecticut. But any contentment he has experienced in his life is broken when his parents decide to separate. Due to his dad’s poor financial planning, his family has also gone bankrupt and they have lost their house in Connecticut. Trevor’s mother takes off for England to stay with her parents and Trevor travels with his father to visit his father’s family in Seattle. It is strange and alarming that Trevor has never met his paternal grandfather or his Aunt Selena. When Trevor arrives at his ancestral home in Seattle, he discovers that Riddell House and his family have a long and tragic history which is slowly revealed to him throughout his visit. His great-great grandfather, Elijah Riddell, Trevor learns, made a vast fortune from buying land, clearing forests and selling the timber. Riddell House itself is made from this plundered timber and it is now falling into a state of decay and receding back into the forest from which it came. What will be the fate of this ancestral homestead and the prized forest on which it sits? 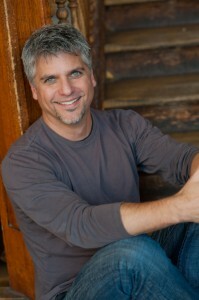 Garth Stein’s ability to create interesting and dynamic characters is nothing short of literary genius. The reader is instantaneously drawn to Trevor, a 14 year old boy who is not quite an adult but is astute enough to know that what is going on around him at Riddell House does not seem right. He is able to research and delve into his family’s history and even connect with the spirits of past relatives who still dwell at Riddell House. Selena, Trevor’s eccentric aunt, seems nice and kind but there is something peculiar about her and at times her behavior even appears to be sinister. Like everyone else in the family, she has been damaged by the family’s tragic past and she is so desperate to make her life into something else. Grandpa Samuel displays the signs of dementia but he has moments of lucidity during which he reveals family secrets to Trevor. And Trevor’s father is clearly scarred by whatever drove him from Riddell House as a teenager and has kept him away ever since. There are so many reasons why I enthusiastically recommend reading A SUDDEN LIGHT. The prose of this novel is enchanting and matches the dream like state of Riddell House. The plot, which blends historical fiction, ghost story and family saga, is riveting as the Riddell family secrets are slowly unraveled to us through a series of old letters, diary entries and dreams. Finally, the multi-dimensional characters cause you to have an emotional attachment to them and you will be sorry to see them go when you close the last page of the book. I suggest that you quickly finish whatever book you are reading now and follow Trevor through his journey in A SUDDEN LIGHT by Garth Stein. 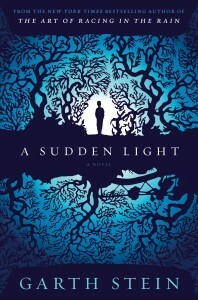 This giveaway is for a SIGNED Hardcopy of A Sudden Light. It is open to residents of the US or Canada. To enter, please leave me a comment below in the comment section and let me know what about this book appeals to you. A winner will be randomly selected from all entries. Contest ends 11/2 at 12:00 a.m. EST. Well, you caught me with “rich and flowing prose.” I’m a sucker for a well-written family saga! I absolutely love reading books by Garth Stein. He is a great author with a unique voice. I would LOVE to win a copy of his newest book!!!! Thanks so much for stopping by and entering! What has peaked my interest in this book is the multi generations that appear in the book, family history is where it is at. Hi Melissa! I was attracted to your review of this book for its historical fiction genre (my favorite) combined with the ghost story. When I first moved to CT, we rented a home in Brooklyn that we believed was haunted. I always thought it had a story to tell…whether I win your book giveaway or not, I will read this book! Thanks for your reviews. They are so helpful! Exquisite review! I love your site and will continue to check in! Loved the Art of Racing in the Rain! Can’t wait to read this book. Sounds creepy and intriguing! That it’s written by Garth Stein is enough for me! Beyond that, that, there is the “multi-generational saga” aspect that appeals greatly to me. The family saga and flashbacks to earlier time periods was actually my favorite part of the book! Thanks for stopping by and entering. I have put this on my list of books to read when I retire. Wish I had more time to read while teaching. Oh well, soon there will be time. Filia refectoris librorum bonam magestram eloquens reprehensricemque est. I love historical fiction particularly when it as well written as you describe in your review. Thanks so much and thanks for stopping by and entering! Love Garth’ s phrase, “We do no see things as they are, we see things as we are.” How true, but how many would want to argue that point. I can hear book clubs, such as my two, arguing the nuance’s of that statement. This would be a fantastic book club read! And his writing is so captivating, I loved the quote you posted. Thanks so much for stopping by and entering! Hi Melissa, This book was written for me! Eccentric family members with secrets, historical setting, rich character development, and a connection with spirits! It sounds like a book that I would get lost in. Your review hooked me! Melissa, your review of Garth Stein’s book is very intriguing. You captured my attention at “Greek mythology” . Also, historical fiction and mysteries are my favorite genres. Thank you for recommending this book. Looking forward to reading it soon! I loved your description of the prose, but the author’s description of the “non-traditional…multi-generational…ghost story” really captivated me. I want to know more. I want to know about the spirits from other dimensions seen “from the corners of the eye” the author mentioned. This is a book that I know I must read, one way or the other. It’s a must-have. Thank you for introducing me to this work. The novel sounds unique and captivating. The historical aspects and the mystery combine to interest me greatly. Your feature is very interesting and intriguing. thanks. Thanks so much for stopping by and entering! I really is a great book. I loved The Art of Racing in the Rain, wanted to read this one as soon as I saw who the author was. Thanks for stopping by and entering! It really is a great book. What about this book doesn’t appeal to me? Curses, enchanting prose…It sounds wonderful! Great point!!! Thanks for stopping by and entering! Well as usual, the cover grabbed me. And also as usual, your review grabbed me. I’m in! Hi Melissa, I really enjoyed, The Art of Racing in the Rain. This new book sounds like I’d enjoy the subject matter even more! Can not wait to begin reading! Thank-you for your book reviews! Thanks so much for looking at my site and entering, Janet!